Only shootin' stars break the mold "
The popular Kidz Bop series of audio CDs (there are currently four titles) promises "kid-friendly versions of today's biggest hit songs," and this DVD release takes the concept to the next level by featuring mini music videos to go along with the songs. The premise of a bunch of kids singing hit songs (as opposed to the original artists) might make some folks cringe just on musical principle alone; the thing is that young viewers really love to watch the same thing over and over, and as a parent I would much rather hear a slightly sanitized version of Jimmy Eat World's The Middle, which is one of the songs included on this disc, than one of the usual sappy original ballads found on most kid titles. Smart thinking, Kidz Bop people. 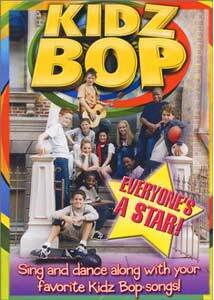 In Kidz Bop: Everyone's a Star, a hodgepodge group of eleven boys and girls (whose ages seem to range from 10-12) meet outside a sold-out rock concert and decide to put on their own show. The makeup of the cute, energetic cast—none of whom who are ever identified by name—is your typical set of easily recognizable caricatures (tough guy, nerdy girl, smart kid, drama queen, etc. ), and they sing and dance on what appears to be one of those neat and clean New York City neighborhood backlots where they frolick through water shooting from a fire hydrant, do the limbo, and have a pie fight. In between each of the seven songs, most of which include on-screen subtitles for sing-a-long, there is a brief bit of dialogue that seques conveniently into the next number. I have no idea who is really singing these songs, though it is obvious that some kids somewhere were singing the background chorus. Is it the actual onscreen cast? Beats me, and Kidz Bop has oddly enough kept that information fairly well hidden. Some of the songs (What A Girl Wants and Soak Up The Sun, specifically) sound like they were done by "older" performers, but it is really anybody's guess, and it seems that we weren't meant to find out the real answer. Musical credits notwithstanding, it seems even a bigger shame that the cast doesn't get any noticeable recognition in the credits, and while it certainly looks like they had a lot of fun shooting this, it seems strange that the individual kids aren't promoted more, or at the very least given character names. Image Transfer Review: The 1.33:1 full-frame transfer is a step above most run-of-the-mill kid-vid titles, and has a steady palette of bright, nicely rendered colors. The source print is very clean, with no visible nicks or blemishes, and seems to be devoid of any major compression artifacts. Audio Transfer Review: Audio is provided in a pleasant 2.0 surround mix that is spread evenly across the front channels only. Song vocals are pushed upfront, and the whole presentation (while not particularly bottom heavy) sounds just fine. Extras Review: Extras consist of a 13-image photo gallery of the kids, along with commercials for Geo's Dance Party, Cheer! and the Kidz Bop CDs. The disc itself is cut into 9 chapters. Like a lot of DVDs, this is definitely a niche market title. It is, though, assembled professionally and should no doubt appeal to the intended demographic, which I suspect is kids between the ages of 5 and 10.